Made of wood veneer, hardwood, and MDF, this armoire is adorned with a glass window. It is complemented with a beautiful, black finish, which gives a classic, elegant look of this cabinet. Featuring 48 inches high x 14 inches wide x 4 inches deep, this cabinet is a perfect addition to your room. It only takes very less storing space, yet it allows you to keep your jewelry collection organized, and to benefit from a mirror that shows you an accurate reflection of yourself. Whenever you need something functional and stylish for your jewelry collection to keep in your room, this Black Finish Wall/Door Mount Jewelry Armoire Cabinet is the right choice. It perfectly combines functionality and style, offering you more that you may expect from a cabinet. It is easy to mount on any door or wall. 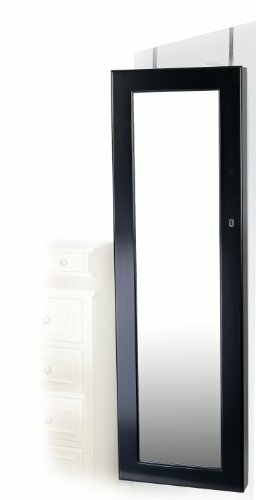 This jewelry cabinet is adorned with a large, vertical mirror, which you can use when you try on your outfits, jewelry and accessories. It is excellent to allow you to get a last-minute check of your appearance, prior to leaving home. 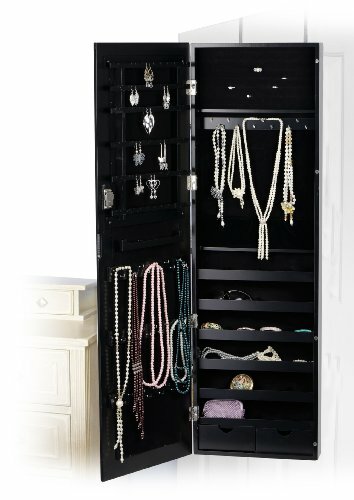 As you open the mirrored door of this jewelry armoire, it reveals the hidden space, which is excellent for organizing your necklaces, bracelets, earrings, rings, watches, make-up items, purses, and much more. Inside this armoire, you’ll find hooks for necklaces, as well as holes for hanging your earrings. Besides, there are also specific compartments that you can use for holding some other jewelry and accessories, such as rings, bracelets, purses and others alike.